Many dishes cannot be imagined without this plant, which is considered one of the most popular spices all over the world, but scientific studies have shown that ​​basil tea, as well as essential oils have a lot of healing properties. Basil tea suppresses the infection and eliminates bacteria, improves mood and concentration, relieves digestive problems, it is a great fighter against migraines and severe headaches, when used in the form of patches, helps to better and faster heal the wounds and much more. Learn how the plant grows and how to preserve it, as well as how to make a medicinal tea. We will share with you a few culinary ideas for delicious recipes that use basil as a spice. Basil Latin name Ocimum basilicum is an annual herbaceous plant, native to the Indian subcontinent. 3,500 thousand years ago it was also found in the pyramids of Egypt, together with the pharaohs. Also, it is considered that it grew on Golgotha, the site of Christ's crucifixion. It is believed that with the conquests of Alexander the Great it was cultivated in Macedonia and Greece. Today it is widespread in the wider Mediterranean region. In the United States it is mostly grown in California. It also used to be cultivated in the royal gardens of ancient Greece and medieval Byzantium, as a spice plant. It is usually grown on about 50 acres, and its surface reaches up to 5,000 hectares worldwide. The basil plant is grown in two ways: in the greenhouse (greenhouse) and in the open field. The glass plant is grown in pots, containers and in bulk. After selecting the good quality seeds, it is necessary to choose the soil substrate which also needs to be of better quality. It must be completely healthy, well-tested and disinfected in order for the planting to succeed. Those of darker peat whose PH value is 6 are recommended. The plant requires a lot of light and heat. Adult leaves and herbs are picked at the beginning of the flowering period, so that in the year you can achieve two to three harvests. The most common is green basil, but there are also anthocyanin dyed: purple - who have curly leaves with serrated edges beautiful and attractive as an ornamental plant, and dark one – with a stronger taste, like ginger. This plant is very popular in modern phytotherapy and in pharmaceutical industry, but is most commonly used in food as a flavouring additive and a preservative, and also beneficial basil tea is used. It is known that around the world grows about 150 different species. It is known that secondary metabolites basil possess have an exceptional biological activity, and that they have fungicidal, bactericidal, antiviral, chemopreventive, antioxidant and radioprotective effect. So, it is a very medicinal plant. The above-ground part of basil is used in teas in phytotherapy, as well as in cooking, and its essential oil is very important in conserving and preserving the quality of the food. It is an indispensable ingredient or spice in the Italian and French cuisine which is added to a variety of pastes, sauces and popular meat dishes. It is a good stimulant to improve mood, and helps in cases of insomnia and bed-wetting. In the leaves of basil there are carbohydrates, vitamins A and C, as well as acids (oleanol and ursol), tannins and saponins. Its aromatic leaves showed that basil as a remedy is very useful in the cases of swelling of the joints and arthritis, but it may be helpful to diabetics because it reduces the levels of glucose in the blood. Basil plant became a part of various herbal mixtures that are applied in the cases of digestive problems such as spasms and inflammations of the intestines. 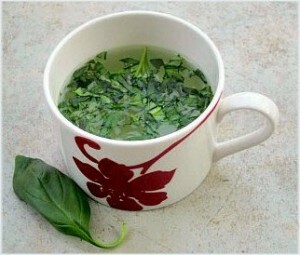 How is the ​​basil tea prepared? One teaspoon of herbs pour with a quarter of boiling water, after ten minutes, filter it. Tea made from basil is drunk in a little small cups during the day, not longer than eight days, then you need to take a break of two weeks, and again you can continue with the treatment. In combination with leaves of birch it successfully treats liver diseases, gout and dropsy. Basil tea should not be sweetened, it is best to take it between meals. Mix 20 grams of leaves of basil and rosemary, in this mixture add 5 grams of propolis and pour with a litre of boiled white wine. After the mixture cools well, strain it and add 100 grams of local honey. This wine made from basil take in 2 small brandy glasses before a meal. A litre of boiling water pour over dry basil leaves (30-50 g), let the tea sit for twenty minutes, then strain it. Drink every day one cup immediately after a meal, and you will solve the unpleasant gases. Nonetheless, it is known that basil tea relieves migraine, severe headaches, and suppresses and improves memory and concentration. In severe colds, inflamed sinuses and other respiratory ailments inhalation with basil is recommended. Salt - one teaspoon (or even less). How is basil pesto made? Wash the plant and put it in the blender along with the pine nuts and garlic and mix well. To the mix from the blender, add parmesan cheese, slightly add olive oil, until you get a nice homogeneous mixture, which looks like a thick mayonnaise. Make sure that for the pesto you use only the leaves of basil, because from the twigs and flowers you get astringent and bitter taste, and therefore, always remove them, the same rule applies for the healing basil tea. Fresh basil is mixed with ground pepper and grated lemon peel. You will get an aromatic butter, which can serve as an adjunct to various types of roasted meat or fish. Dried plant has a stronger flavour than fresh, and except for the basil tea, it can be added in a variety of stews, salads and vegetable dishes, and can also serve as a cream. Wrap the fresh basil leaves in a wet kitchen paper, put it in a plastic bag and refrigerate for up to two days, whether you are planning to make basil tea or something else. It can also be conserved in olive oil or vinegar, frozen or dried. During the winter months the leaves of basil are put in jars, pour mild salt or pour olive oil over it. The jars are sealed tightly and put in the refrigerator. If you want to freeze the leaves, then they should be mixed with a little water and put in a bowl of ice. When the basil dices are frozen, they can be put in a plastic bag and kept in the freezer. When dried, make sure you leave the leaves in a well-ventilated place that is well protected from the sun.